This is Part 1 of our series on jewel ownership. From time to time, "crown jewels" gets thrown about as a descriptor for any old gem worn by a royal. That's not really the right story, though, because proper crown jewels are in a different class. They are owned by the state or the crown (depends on the country), and can include a whole different set of objects. What's included in a crown jewel collection? That's different for every country (and not every country has such a thing, mind you). The first thing that might come to mind is regalia - the objects associated with coronations, enthronements, and such; you know, the sacred rites of monarchy. These items are the most frequently included elements of crown jewel collections, and the British crown jewels are the most famous example. You can visit the regalia at the Tower of London - certainly worth a trip, if you've never been. Crown jewels, though, are neither limited to regalia nor do they necessarily include regalia - it all depends on the country in question. All sorts of precious items can be included, like baptismal fonts. Wearable sets of jewels - by which I mean gems that are suitable for wear for events less important than coronations - can fall under the "crown jewels" label as well; those that are the most relevant to the set of royals we normally chat about are the Danish and, again, British jewels. How do jewels become crown jewels? Some items, regalia being a prime example, can be crown jewels not just because of their historical significance but because they may have been funded by the state in the first place. Other items can be given over to the crown jewels by a royal, or can be left for future use in a will. ﻿When it came time for her husband's coronation Queen Mary funded a brand new crown for herself, but she then gave it over for use by all future Queen consorts (of course, this hasn't happened yet as she ended up using it herself, sans arches, for her son's coronation and the future Queen Mother had to come up with the crown shown above instead). 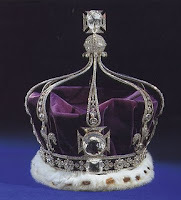 Queen Mary also sent a few other items in her possession as queen to the Tower of London for inclusion with other crown jewels - items that came from some of the riches she received as India's Empress, plus a few rings and so forth. Denmark's crown jewels got their start when Queen Sophia Magdalene (1700 - 1770) bequeathed some of her gems to future queens. (The Danish crown jewels are now displayed at Rosenborg Castle.) Over in Britain, Queen Victoria did the same; she left some of her most important and regal pieces to the Crown, for use by future queens. A few of these jewels were included with the Victoria & Albert: Art & Love exhibition, where they were labelled as state jewelry. Why does this matter? As always, all of this information is very detailed and customized to each country, and this is just a basic overview to get us back to our original question: how does this factor in when you're trying to figure out why collections are a certain size, and why jewels are or are not shared? First of all, these items are not privately owned. Britain's crown jewels are a part of the Royal Collection, which "is held in trust by The Queen as Sovereign for her successors and the Nation." I think that's a good way to phrase it - whether owned by the state or the crown, these things are kept in preservation of a history which belongs to an entire nation. To our point, that means they aren't going to be sold, given away, or doled out as part of an inheritance; so long as a monarchy remains intact, so should the crown jewels (should being the operative word). Second, these items are subject to the greatest restrictions on use. Lots of these gems were specifically left for use by queens. Only Queen Margrethe wears the Danish crown jewels, for example, and she is prohibited from taking them out of the country. In other words: don't expect a lot of sharing to happen. Next time: the scoop on family foundations.